Looks like the first iPhone 6 problem that could cause some trouble for the company is finally here. Several users have started to report a rather strange problem occurring with their iPhone 6 Plus modules. The complaints come in the form of postings at the MacRumors forum with users posting pictures of iPhone 6 Plus units that have started to bend. Apple has had difficulty with technical issues related to the iPhone in the past. The most notorious of this was perhaps the antenna issue that the iPhone 4 faced at the time of launch. Several users reported that the phone was dropping signals due to an issue with the lower end of the device. Apple blamed the fault on software problems and provided free bump cases to users facing the issue. 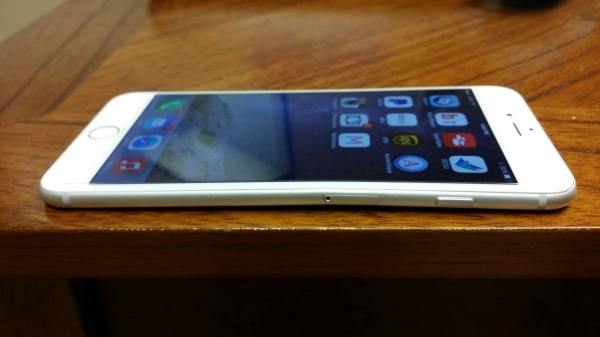 iPhone 6 Plus Reportedly Bending After Days Of Use – Next Big iPhone Problem? While antenna problems on the iPhone 4 could be credited to software issues, it’s impossible to say the same about the iPhone 6 Plus. The cause for this defect can possibly be attributed to the device’s thin size and the overall size of the screen. This when combined with the manufacturing materials seems to be causing some unintended side-effects. Users are reporting that the fault appeared in the iPhone 6 Plus after the device was left in the front pocket of a suit pant. After 18 hours, the device has started to bend, as shown in the photo above. Apple is yet to comment on the issue but if the amount of complaints arise, Cupertino will be forced to respond. So for all the iPhone 6 Plus users out there, avoid the combination of a front pocket and your device. Update: Looks like the problem is increasing as more pictures have started to become available courtesy of our viewer Nem. Thanks!